Everyone’s got problems. Especially today. Maybe it’s because we’ve lost the artistry of living that the Italians know so well. They call it benessere “a sense of well being”. Traveling in Italy and staying with my Italian family and friends has led me to believe that Italians seem to know how to balance work and relaxation, surrounding themselves with beauty and art in their homes and businesses, eating fresh and vibrant food and focusing on family and friends. Italian design and fashion, culture and living, the way Italians prepare and eat their food all combine to create a sense of well being that doesn’t depend solely on the size of your bank account or stock portfolio. Italians have long understood how art and beauty forge and strengthen our emotional bonds to life to create a sense of well being and lighten our discontent. Here are 10 ways Italian “benessere” is making the world a better place. Italy is a country with “un cuore verde”, a green heart. A country that measures its worth by preserving and protecting the land. In Italy green agriculture and eco-sustainability have been a powerful movement for decades. The pleasures of the table and ecologically-balanced farming methods are valued and encouraged. Italy’s farmhouses, family vineyards and orchards have always been a model for land to hand cooking. The traditional agricultural roots of Italian casalinga (homestyle) cooking are a legacy of Italian cuisine that we can all benefit from. Wine is not simply considered an alcoholic beverage in Italy. 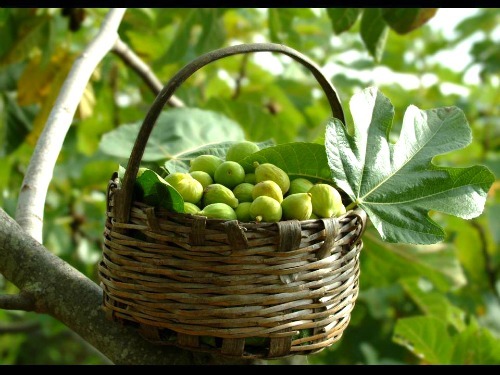 It is part of the local culture, a product of the land, a family tradition and an integral part of the Mediterranean diet. Recently there has been a lot of buzz about the healthy lifestyle and longevity enjoyed by the people of Sardegna who drink Cannonau, a dark red wine said to contain the world’s highest levels of antioxidants (two to three times the level of flavonoids as other wines). 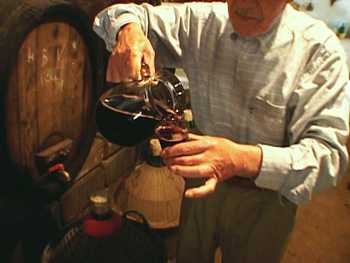 The people of Sardegna who drink this wine are 10 times more likely to live to be 100. Research and the known effects of flavonoids have shown that moderate wine consumption may increase life expectancy while also lowering stress levels. Wine may not be able to solve all the world’s problems but reducing stress often allows us to put our problems in perspective and find a more balanced solution. 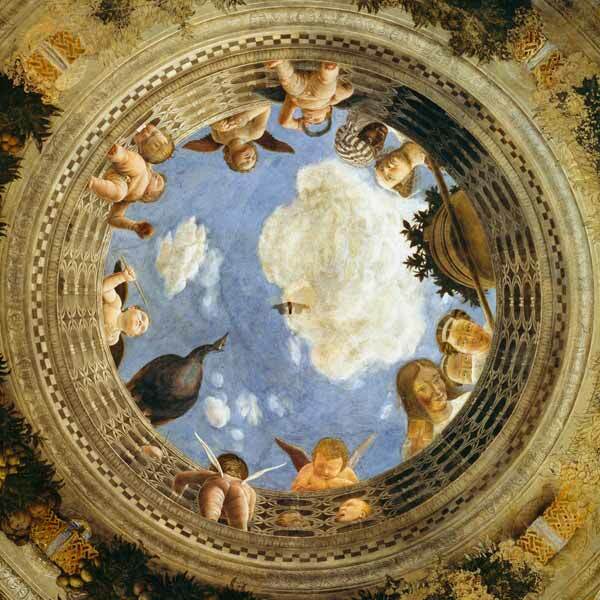 Love is in the air all year long in Italy and has been for centuries. While we were busy developing the austere virtues of the Reformation, the Italians were relaxing in the inspiring glow of the Renaissance. And although we might want to identify the Italian style of love differently, Italians more often equate love with the concept of enchantment, charm or delight, innamorato. 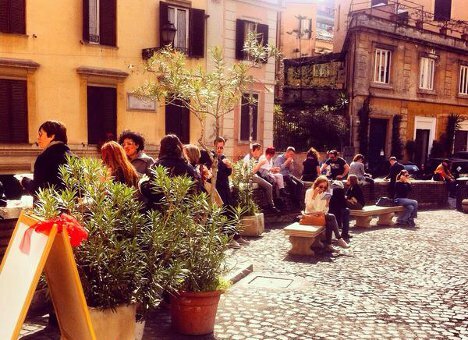 Italians take pleasure in the companionship of friends and opening themselves to life on the piazza. My Italian friend Luca once told me that his day would not be complete if he did not connect with at least one of his friends. 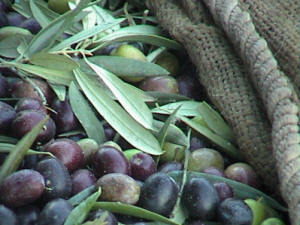 Since ancient times Italian olive oil has been an integral part of the way Italians eat. High in polyphenols and protective antioxidants beneficial to heart health, extra virgin olive oils are an important part of a heart healthy diet reducing the risk of variety of diseases and promoting good health. Italians share their love of olive oil and Italy’s precious bottles of “liquid gold” are available all over the world. Laura Biagiotti, known for her Italian cashmere collection, has said that “Italian fashion is meant to add the extraordinary to everyday life”. From ancient Italian cultures to the Great Masters of the Renaissance, Italian art and design transcend politics, gender, economies and cultural differences to inspire and elevate all peoples of the world. According to National Geographic writer and Emmy award-winning documentarian Dan Buettner the secret of longevity is encoded in an Italian cheese. Whether or not an Italian cheese can save the world remains to be seen but Buettner who travels the globe to examine and unlock the secrets of long life claims that a Sardinian sheep’s milk cheese is a start. 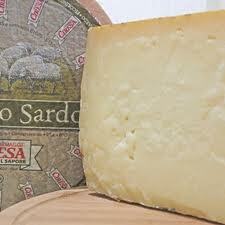 Eaten as part of a diet among people in Sardegna, designated by Buettner as a World Blue Zone (regions where long lived people can provide lessons for living longer and improving the quality of life) the cheese, known as pecorino sardo, is made from grass-fed sheep’s’ milk that results in a product which is high in omega-3 fatty acids. 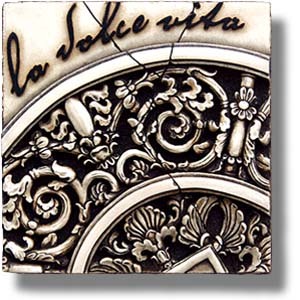 Italy’s contribution to living a life of purpose and pleasure is eloquently summed up by Andrea Bocelli as he describes the essential elements of living life in Tuscany. ”Man was created for living here, where, with the toil of his labour in the fields, he can procure everything that he needs for a tranquil life and where he can also meditate on the profound meaning and spiritual value of his time spent on earth safe from the contradictions, vices, absurdities and tensions of the increasingly oppressive reinforced concrete world, where saying triumphs over doing, having over being, the frivolous over the useful, and the superficial over the concrete”. 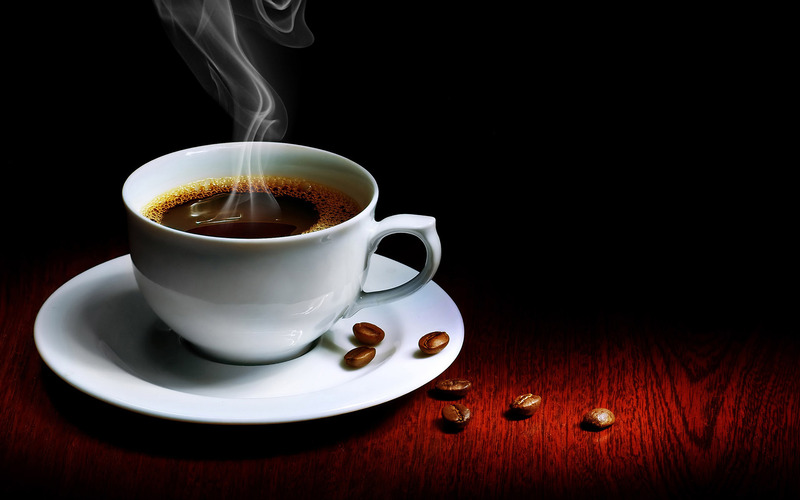 Although Italians may not have invented coffee they have perfected its making and service. Italian coffee beverages bring enjoyment and satisfaction to millions of people all over the world every day and as an espresso has less caffeine than a cup of coffee, a little goes a long way in lifting our spirits. Italians appreciate their families and develop strong bonds with older family members. Elders are celebrated and family is revered. Loving grandparents provide child care, financial help, wisdom and motivation to perpetuate cultural and family traditions. In turn, elders are more engaged and feel a sense of belonging in their families and communities. Time and age is more irrelevant and society as a whole more dependent on family values with encouragement and supportive circle of family members. No country is more perfectly constructed to the benefit of man than l’italia. The natural landscape of Italy is awe inspiring. Italians appreciate the true beauty of their country. Preservation, protection and conservation are part of their DNA. Italians have a better perspective and appreciation for their natural resources. Old buildings are left alone. If needed they are repaired or rebuilt, but otherwise they remain part of the landscape and their timeless charm and ancient beauty enhance the landscape. The patina of age is part of the natural landscape of Italy and Italians are more culturally sensitive and socially responsible for preserving heritage sites and promoting restoration. I’m an end justifies the means flyer. Unlike my travel companions who relish in the rarified air of the wild blue yonder, I view flying as a necessity more than a pleasure. A way to get from point A to point B. One of the main in reasons for this is jet lag. I try to control it but the 9 hour+ trip to Milano always results in a major upset in my diurnal rhythm resulting in lack of alertness, poor sleep, irritability and stress. Not the way I want to hit the Via Montenapoleone. I’m in Italy and jet lag is part of it. I’ve read about, heard or tried most of the conventional wisdom on avoiding jet lag. Adjusting your sleep patterns before departure, light therapy, aromatherapy, herbal remedies, vitamins, acupuncture, turning your watch to the time of destination as soon as you get on the plane and various other sleep aids, all claiming to cure jet lag. A recent delivery to my in-box by Afar Magazine seemed to imply that I was approaching it from the wrong way. Don’t fight it. 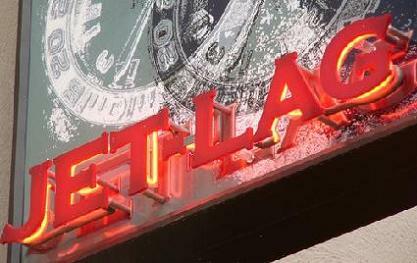 Embrace it and they offered 6 ways on How To Make the Most of Jet Lag. All focus on a reactive approach which may be the better tack to take than loading up with pills. My cure for jet lag is proactive and involves turkey, pumpkin pie, football and the somnolentic coma that follows a traditional Thanksgiving Day dinner. You can read about it here as well as a reference to Dr. Charles F. Ehret, a biologist at the University of Chicago’s Argonne National Laboratory, who developed a program that uses a series of planned foods (proteins and carbohydrates) to re-set nature’s internal clock to help your body adjust to a new time zone. His method and mine, as well as one of Afar’s suggestions, both involve the word “feast”/”food” and to paraphrase Hippocrates about curing what ails you – “Let food be thy flight medicine and flight medicine be thy food”. 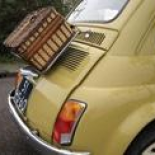 A picnic in the Italian countryside in your classic Fiat 500 or ______. Just fill in the blank and your picnic basket with salumi, salame and a crusty loaf of bread. My choice would be a rustic Tuscan pane and a selection of Italian cold cuts like mortadella, capicola and finocchiona (if I could get it). Add a few bruschetta toppings, a selection of mostarda, some fruit and formaggi (a truffled pecorino would be very nice). For dessert, a melon with prosciutto and biscotti to dip into my flask of Vin Santo. Speaking of wine no self-respecting Italian meal would be complete without vino. So bring along a bottle of wine and to quench your thirst include a bottle of aqua minerale (San Pelligrino or Panna would be a good choice) and Italian soda. Planning an Italian inspired picnic. Of course you’ll need a cutting board, corkscrew, cheese knife and a nice cloth and plates. Although there is no reliable etymological translation for the world picnic in Italian, an outdoor meal eaten al fuori (outdoors) in the countryside or a garden is widely described in Italian literature and a well-laid table was encouraged to heighten the experience. Our Italian family were known for a well-laid table set in the Italian countryside. 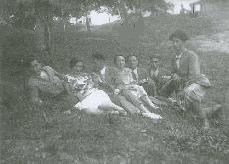 Here is a picture of them circa 1919 relaxing in the countryside near Vicenza. To me it represents the idyllic Italian lifestyle and pleasures of “villegiatura”, leaving the life of the city for a villa in the country. Even though our Italian family did not have a villa along the Brenta Riviera they still enjoyed picnics in the Veneto. An Italian inspired picnic is my way of bringing Italy home and capturing a small slice of “la dolce vita”.